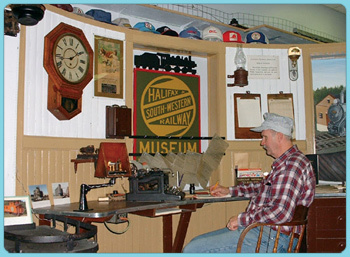 Step back in time at the Halifax and South Western Railway Museum just outside Lunenburg on The Lighthouse Route. This feature-packed display provides the sights and sounds of a stationmaster's office from the 1940's including the clacking of the telegraph sounder and the clanging of the locomotive bell. An extensive S-gauge model railway shows many of the stations and scenes along the H&SW, including Liverpool and Lunenburg, as well as an authentic portrayal of the station, roundhouse and yard in Bridgewater. Fun is at hand for the entire family. Admission charged. Address: 11188 Highway 3 (Bridgewater to Lunenburg) just outside Lunenburg town limits. Copyright 2006, the Nova Scotia Railway Heritage Society, all rights reserved.